AEROSHINE is a stainless steel cleaner liquid application with a viscosity to allow for adhesion to vertical surfaces, yet thin enough to use in a spray application. 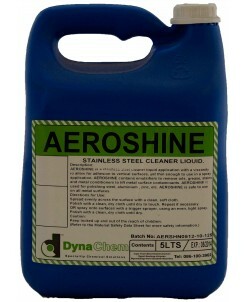 AEROSHINE contains emulsifiers to remove oils, grease, stains and metal conditioners to lift metal surface contaminants. Spread evenly across the surface with a clean, soft cloth. Polish with a clean, dry cloth until dry to touch. Repeat if necessary. OR spray onto surfaces with a trigger sprayer, using an even, light spray. Polish with a clean, dry cloth until dry.